See how Cisco and Viptela make a case study for a successful acquisition. What makes a good startup acquisition? Big companies are known to acquire smaller startups—sometimes for talent, sometimes for innovation—but the relationships aren't always happy marriages. And only a very small number of these have gone on to change the landscape of their industries. A notable example includes Google's acquisition of Android in 2005 for $50M, which completely changed the mobile game. Another is Disney's acquisition of Pixar in 2006 or Facebook's acquisition of Instagram. It's been just over a year since Cisco acquired network virtualization company Viptela. Now with a speedy transition and integrated technology with Cisco, Viptela could be a top case study for a successful acquisition. And it has worked because of three key reasons: integration of talent, strategy and vision, and a relentless focus on execution. So how can it be done? First, you need to know about the Software-Defined Wide Area Network (SD-WAN), which has become an important focus in networking. SD-WAN revolutionizes the way that enterprises inter-connect their infrastructure and locations, no matter how far apart they are. It delivers software-based, over-the-top agility to network administrators saving significant time for adding large-scale capability. This saves enterprises money, and it cuts down on the number of people involved by using cloud-based management. Cisco had flagship products in an adjacent category to SD-WAN called IWAN (Intelligent WAN) , but it needed elements of cloud management and cloud control that were missing. Enter Viptela. 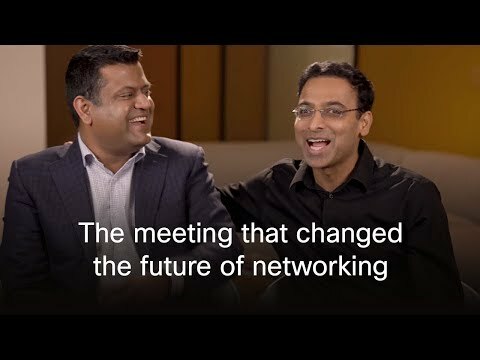 "We felt there was a fit with SD-WAN tech to our infrastructure that gives higher bandwidth, improved automation and flexibility as well as lower cost to manage and operate on an ongoing basis," said SVP of Engineering for Cisco's Enterprise Networking business Anand Oswal, "When we did a deeper dive of their architecture and software, we felt we could easily integrate it into our existing portfolio." Differentiated technology is important, but the people were just as important in the decision to acquire Viptela. "What I felt was they had the same mission as us," said Oswal, "Anytime we do an acquisition, the team and leadership mindset is critical. What is their vision and mission statement? How we could make one plus one equal more than two?" Oswal tells us that most of the core Viptela team is still with Cisco. Something that is crucial to the success of an acquisition is the ability of both people and products to stay intact. Cisco leaders have helped accomplish this. "We've been given quite a bit of room and autonomy actually to make some important decisions," said Senior Director, Product Management for SDWAN Ramesh Prabagaran. "A lot of the product itself has remained intact, which is important. At the same time, we have scaled what we brought in to an enormous level. What we thought we would do, versus what we have accomplished, is two to three times." "We have brought together Viptela's high-powered innovation and execution-focused engineers with Cisco's vast breadth of knowledge and domain-experienced engineers," says senior director of SD-WAN engineering Nehal Bhau. "This team has already done wonders in a short timeframe by combining the state-of-the-art Viptela SD-WAN solution with industry-leading routing platfoms. The early adopters are already reaping the benefits of the joint solution." In mid-2017, with Viptela's people and product ready, only time would tell if the acquisition would be a success. One of the first projects after the acquisition was the integration of Cisco's ISR/ASR (Integrated Service Routers/Aggregation Service Routers) with Viptela's SD-WAN technologies to create Cisco's new SD-WAN: the combination of a robust product and a new way of thinking. It brought in a simple consumption model where customers can operationalize the network quickly. "This amplifies the whole value proposition that we can give to our customers," says Oswal. "If customers want to use the breadth of our best-in-class platforms and enable SD-WAN, we can do that by keeping all of the key value-adds including the cloud model." What this means is that customers who have existing routers can do a simple software upgrade and get all of the new capabilities. Cisco SD-WAN promises that customers can deploy new applications in minutes with a consistent user experience, a faster and easier deployment of WAN, and a secure connection that encrypts data for protection. "In July 2018, we got it out to the market," said Oswal, "Customers who have deployed it have offered a lot of positive feedback about how it dramatically simplifies their network." Cisco has seen significant customer adoption since the acquisition with wide deployment of the technology to date. One year post-acquisition and already delivering on integrated SD-WAN technology, the Viptela teams are already peering into the future. Some of the possibilities the team is exploring include the migration of customers from on-premises data centers to the cloud. Secondly, security, and how CIsco might be able to bring in its large arsenal of security products into SD-WAN. The third is the application assurance and how to make applications that move to the cloud perform better. "Three key areas we're looking at are cloud, security, and app assurance and optimization," says Prabagaran. "It's not just a strategy, but where we are heading and where we're investing in the area as well." With one year in and already an integrated product out to market, it will be compelling to see where this acquisition case study may go in the future.